There were two SSIDs of interest: a dual-stacked one (“CiscoLive2019”) and one with v6-only plus NAT64 (“CL-NAT64”). For some background on the underlying infrastructure components you might look at this thread by Nicolas Darchis from the NOC or at this tweet from Dominik Pickhardt. Some stats on IPv6 usage at CLEUR can be found here. Let’s have a look at a few IPv6 parameters of those SSIDs. The Router lifetime and the Reachable time are tweaked in a way common for WiFi networks, for reasons which Chris had laid out when discussing our own setup at Troopers (see his “Building a Secure and Reliable IPv6 Guest Wifi Network” talk from the TR16 IPv6 Security Summit or this post). One might note that both entities send their RAs with the same Router Preference (that is the default/Medium) and that no typical HSRPv2 MAC address is involved (see here for some information on HSRPv2 MAC addresses). To me these observations seem to indicate that neither an IPv6 First Hop Redundancy Protocol (FHRP, like HSRPv2 or VRRPv3) nor a RA-based HA approach (as the one laid out in the “Are Router Advertisements Good Enough?” section in Ivan Pepelnjak‘s “IPv6 High Availability Strategies” talk from the Troopers 2014 IPv6 Security Summit) are in use but that potentially some redundancy approach on the device layer (like VSS) is performed. I’m not sure what this means from a traffic handling perspective (from the top of my head I seem to recall that older Windows versions used per-packet load sharing in such scenarios but I didn’t quickly find a link and I did not perform any testing). Still I could imagine that different OSs might behave differently in such a setting (as RFC 4861 sect. 6.3.6 is quite vague in this regard) so, honestly, I’m a bit hesitant if this is a good approach (but evidently I might overlook sth here). The reader might also note that DHCPv6 is not in use at all, neither stateful nor stateless (no corresponding RA flags are set). Also the RAs do not carry the option 25 (RDDNS) as of RFC 8106. 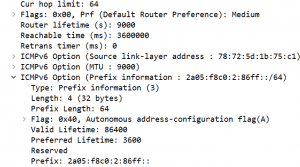 This means that clients associated to the CiscoLive2019 SSID don’t have any IPv6-based DNS resolver information at all, which purists might hence not call a “fully dual-stacked network” (but ofc AAAA records can be resolved by the IPv4-based DNS servers given DNS is agnostic as for any relationship between the underlying IP transport of DNS queries coming in and the type of records they ask for). Andrew Yourtchenko commented that this approach was mainly chosen in order to “avoid complexity with troubleshooting”. I’m a bit scratching my head here as for the implications of these two (RFCs) on IPv6 Jumbograms (as of RFC 2675) but I will skip this for the moment and for the purpose of the present post. Obviously I was more interested in the configuration of this one and indeed some very interesting observations could be made here. While we’re happy to see Chris’ post on “RDNSS (RFC 8106) Support in Windows 10 Creators Update” being referenced here I consider this a really bold move. We know some people currently performing v6-only+NAT64 pilot installations on a large scale (namely for WiFi networks with “unmanaged clients”) and those persons usually insist that proper distribution of v6 DNS information by both technical ways (option 25 in RAs plus stateless DHCPv6 with DNS information) is crucial to support as many clients as possible. In practice this meant that at CLEUR I couldn’t use the CL-NAT64 SSID with my own laptop (running Server 2016 which does not support RFC 8106, see also this post on its IPv6-related properties). On the other hand the DHCPv6 space doesn’t have a reputation of a huge degree of conformance with RFCs anyway ;-). Getting back to the topic of v6-only & NAT64 I have to say that I was connected with my iPhone to the CL-NAT64 pretty much the whole time and I did not observe a single issue (incl. testing of some common applications like Threema, iMessage, DB Navigator and others). But this is only an anecdotal contribution which is why we’re currently building a proper test lab to test a variety of devices and applications in a v6-only+NAT64 setting. Chris and I will give a talk about this and further aspects of such networks (like monitoring, measuring progress or incentivizing its use) in the NGI IPv6 track at TR19. At CLEUR Mark Townsley gave a very interesting talk on “Beyond Dual-Stack: Using IPv6 like you’ve never imagined” which provided further thought what one can do with v6-only in 2019; it even included some nice live demos this year. We’ll publish a follow-up once we have initial results of the lab. Stay tuned and/or see you at #TR19.